This is a piece of genuine circumstellar dust. A tiny grain (just ten microns long) of silicates, glasses and carbon. Stars are dusty things. 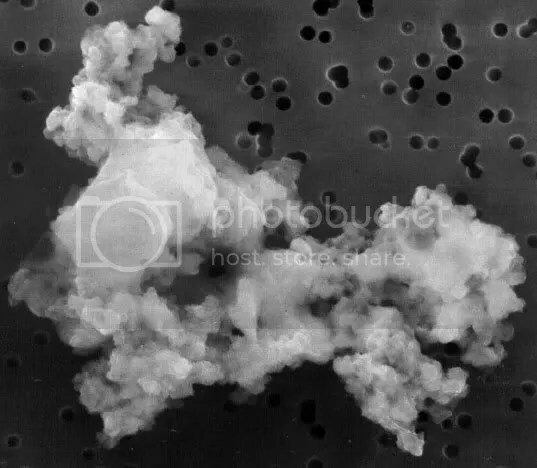 They form from gas and dust, and they spew out gas and dust throughout their lives and when they reach the end of their lives, the exude a huge cloud of dust back into the cosmos. Dust to dust. Quite poigniant really. Space dust is surprisingly interesting stuff. It’s nothing like the kind of dust you find down here on Earth (which is mostly just dead skin). A single grain of dust from space carries a whole history of where it’s been. Dust grains are born when they condense from hot starstuff and form into molecules. The molecules grow into crystals which eventually become dust. If you look at the chemical composition, and the isotopic composition, it can tell you a lot about where it originated. A dust grain, in it’s long travels through space, will be processed many times. New outer layers will be deposited from interstellar clouds, or stripped off by nearby hot stars. Shocks and stellar heat will cause the crystals inside to melt and grow, or even turn into glass. Cold regions will deposit a mantle of ices on it’s surface, which later may either evaporate or become trapped under another layer of silicate. All of this processing gives dust grains a characteristic appearance. Actually, you can tell a lot just by looking at it. This grain, for instance, looks to be an clump made from 6 or 7 smaller grains (each one, a collection of several even smaller ones). The large, flat looking area to the top left looks to have been annealed (flat and scaly-looking — probably crystalline), while the more bobbly regions everywhere else have probably been deposited a lot more recently. Odd as it may sound, lately I feel like I’m becoming something of an expert in cosmic dust. Silicates are surprisingly complicated…! This entry was posted in Imported from Livejournal and tagged dust. Bookmark the permalink.